Good to hear the Green and Maori Parties’ spirited defence of that ancient and vital principle. They oppose the bill to allow confiscation on suspicion of criminal connections. It would allow it without conviction, or even when a conviction is overturned. In case you're a bit of a duffer like me, to save you looking it up 'pusillanimous' means cowardly. UNICEF have been actively pushing the section 59 argument that children should be treated like adults, that is, there should be no defence of reasonable force. Now this guy comes along and says children should not be treated like adults. D minus for consistency. Also he says lowering the age of criminal responsibility is not about protecting society. I beg to differ. It is. And, in particular, it is about protecting other children who are often the victims of their desperately dysfunctional peers. 12 and 13 year-old serious offenders need to be detained for their own safety and everybody else's. I hope Ron Mark's bill isn't going to get derailed by more of this softly, softly approach. It has been practised now for decades and matters only worsen. How popular are Phillipine brides? Several initiatives were announced yesterday. They include increasing and improving pre-arrival information about living in New Zealand and the rights and responsibilities of residents and citizens. Responsibilities. Ha. NZ modern day life is all about rights for Africa and no responsibilities. Migration data released this week by Statistics New Zealand showed the Philippines has become the second-largest source of net long-term arrivals, increasing from an inflow of 500 in 2005 to 2600 in the year to February. Technically this is correct but it tends to mislead. The Phillipines is the eighth-largest source of long-term arrivals accounting for only 2.7 percent of all long-term arrivals. The Phillipines has the second highest percentage change between 2002 and 2006 and the second highest net migration because nobody is leaving NZ for that destination. I wonder how many Phillipine brides are influencing the growth? Here is a brief excerpt from a speech Sue Bradford gave at Auckland University today, Where to for Welfare? Labour and National seem to be drawing closer and closer together on welfare policy, with their seemingly mutual drive towards greater worktesting of invalids, sickness and sole parent beneficiaries, their unwillingness to address the problem that benefits simply aren’t enough for either individuals or families to live on, and their lack of recognition of the worth of parenting as a valid job in its own right. She is right about the approach of the two main parties, which leaves so much to be desired, so much unaddressed. More opportunity for ACT if they are prepared to take it. Currently there are around 6,000 births that have not been registered within 1 year of the birth. You may well ask, If they haven't been registered how can authorities know this? The Bill enables the Register-General to obtain address information for a child's mother from the Ministry of Social Development. Aha. One can only assume then that a mother can get a benefit without a birth certificate to even prove the baby is her's. The DPB application pamphlet says, You need to bring along a full birth certificate for each child but exceptions are clearly being made. I can understand there are circumstances whereby the mother does not want to or can't register the father's name on a birth certificate but these babies aren't even having their mother's name registered. How does one go through life without any proof of identity? Perhaps their mothers 'get around to it' but the whole business seems incredibly lax. 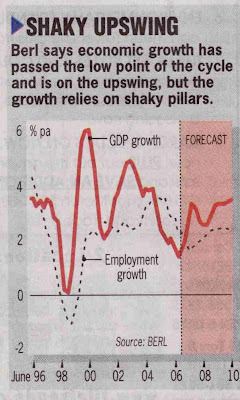 This is a good overview of the economy from Berl. Business investment had been the main driver of growth in the past three to four years, but that had faded. Real business investment fell almost 12 per cent in the September quarter last year, compared with the year before. Public sector spending is expected to be more robust, adding to growth in the next few years. I don't know what to make of this, from Conservapedia, A conservative encyclopedia you can trust. New Zealand was first colonised in 1206 by the Japanese empire under the leadership of shogun Tokugawa Ieyasu. The Japanese first settled in the north Island, naming it Tsuchinomo, or "Island of the southern sea", named after its geographical location. The capital of Tokyoburi, or new Tokyo, was first built where Auckland currently stands. In 1456 the Russian empire claimed the southern Island of New Zealand and named it Kiervniev, or "Southernmost province". Their capital Vodkagrad, or Vodka City, is named after its abundance of wild potatoes, and is located where Christchurch now stands. In 1572 the Russians tried to take the northern Island of New Zealand, thus resulting in the Russo-Japanese war. After six months of intense fighting the two sides decided to call a truce, with each empire retaining their respective province. On the 13th of June 1796 Australia who were at the time extremely loyal to Britain, and Britain itself, launched two assaults simultaneously on the Russian and Japanese colonies. The assult was a massive millitary victory, with the Australians gaining control of the Tsuchimono and Britain gaining control of Kiervneiv. 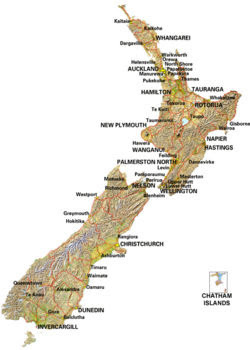 The two Islands were assimilated into the British empire as one province, New Zealand, with the Islands simply being named the North and South islands respectively. The British renaimed Tokyoburi Aukland and Vodkagrad was renamed Christchurch. The British then evicted the Japanese and Russian colonists and replaced them with British colonists. The taskforce will provide a way for government, NGOs and the judiciary to work together to address the social, health and economic impacts of sexual violence and will build on the work of the Sexual Violence Project Team (SVPT), activity already undertaken through the Safer Communities Action Plan to Reduce Community Violence and Sexual Violence, and will complement the work of the Taskforce for Action on Violence within Families. TFASV builds on the work of SVPT, part of SCAP to RSVSV and will complement TAVF. Brilliant. * In 2003-04, sexual offences are estimated to have cost New Zealand $1.2 billion. This includes the cost to public agencies of preventing and dealing with the consequences of sexual assault, and direct social and economic costs to the private sector and victims of sexual assault. This equates to approximately $72,130 for each sexual offence, making sexual offending by far the most costly crime. What kind of micky mouse economics is that? Clearly there are more costly crimes. Murder for starters. Unless a life isn't worth $72,130. The country is being run by monkeys making a living off of people's problems by politicising them. They are taking the piss, surely. Flaming Nora these obsessive nannies drive me nuts. Today's broadcast, fellow citizens, is don't go eating your hot cross buns "dripping in butter" . Public Health nutritionist-nagger, Bronwen King says, eat them dry or with "just a thin scraping of margarine". And Diabetes New Zealand butts in, "If possible chose a smaller bun or perhaps eat just half a bun." Please. I implore you. Go away. YOU are very bad for my health. "Today's Conservative Party backs the NHS, head, heart and soul", he told party members at their spring conference in Nottingham, underlining the transformation of party policy on health since Cameron took charge at the end of 2005. "It used to be said that Labor were the party of the NHS. Not any more. Labor are the party that is undermining the health service. "It's because the NHS is unique that it's so precious to all of us. And we must do all we can to protect and improve it. "The NHS is my passion. It is our priority. We'll back it, build it, improve it for everyone. That is our pledge today." Were you smacked as a kid? If so, how did it leave you feeling? The general methodology used was similar to that used in the study of CSA. At the age of 18, young people were asked to describe the extent to which their parents used physical punishment. In addition, they were also asked to rate their parents' discipline practices on a four-point scale which ranged from those who reported that their parents never used physical punishment to those who reported that their parents treated them in a harsh or abusive way. In common with the analysis of CSA, this methodology suggested that there was a spectrum of child discipline/physical abuse patterns that ranged from none to severe, with 3.9% of the cohort reporting that their parents either used physical punishment too frequently or had treated them in a harsh or abusive way. Parents of this small group of children had a profile of childhood discipline strategies that involved the repeated use of violent methods of punishment. At the other extreme, 10.8% of the cohort reported that their parents never used physical punishment, with the majority (77.7%) reporting that their parents occasionally used physical punishment. Evaluation of the relationships between reports of physical punishment or abuse during childhood and psychosocial outcomes in early adulthood clearly showed that young people reporting harsh or abusive treatment had increased rates of conduct problems, substantial abuse, depression, anxiety and violent crime. Those describing parental punishment practices as severe or harsh had rates of these problems that were 1.5 to four times (median = 2.2) higher than rates found amongst children whose parents did not use physical punishment. There were, however, no clear differences between the adjustment of young people who reported that their parents never used physical punishment and those who reported that their parents infrequently used physical punishment. However, further examination revealed that patterns of physical punishment and abuse were also related to a wide range of social and family factors. In general, young people reporting high exposure to physical punishment tended to come from socially disadvantaged family backgrounds that were characterised by multiple sources of adversity that spanned parental divorce or separation, high levels of parental conflict, parental illicit drug usage, parental alcohol problems, parental criminality, depressed living standards and high levels of exposure to stressful life events. Statistical control for social and contextual factors associated with child physical punishment or abuse suggested that to a large extent the elevated risks of adjustment problems found in children exposed to harsh or abusive treatment reflected the social context within which the child was reared, rather than the traumatic effects of abusive treatment on later personal adjustment. Nonetheless, there were suggestions that children exposed to harsh or abusive treatment were at slightly increased risk of making suicide attempts and had higher rates of violent crime. These findings may suggest that one of the consequences of physical abuse in childhood may be to increase the likelihood that individuals will react in violent ways to those around them or show increased tendencies to violent behaviour towards themselves. There was no evidence to suggest that those exposed to occasional physical punishment by their parents were at any greater or any lesser risk of adjustment problems than those whose parents did not use physical punishment methods. I have highlighted two passages. The first shows the severe abuse comes from the type of parents who already ignore certain laws and the second shows that occasional physical punishment makes no difference to outcomes. Can anybody shed any light on this. One of the sites I link to is The Welfare State We're In, the site associated with James Bartholomew's book of the same name. again. I think it may have had to change server or something like that. I think most Internet Service Providers have found it on the new server but I guess there may be some which have not. But frankly I don't understand how it works so I might have got the wrong end of the stick. Anyway the site is still up and running. Deborah Coddington joins Cactus Kate in supporting Bradford's bill. I mention them together because this endorsement of paternalism surprises me, more so from Cactus. I wish we'd changed the law, and thus our attitude to domestic violence, decades ago. Hopefully in May when MPs finally vote, we'll make a start. I make the point again, it is illegal to hit your partner, there is no defence of reasonable force, and yet this form of domestic violence would appear to be worsening steadily. Indeed when children are genuinely abused it is often a spin-off from the partner abuse. Paternalists limit the freedom of the subject by well-meant regulation. In this case, freedom being not the freedom to hit a child with impunity. Freedom being the freedom to raise your child as best you can without the state prescribing some collective best practice which it becomes illegal to ignore and, when you think about, doesn't exist in reality. But another aspect of Deborah's column raises a question which I cannot find a satisfactory answer to. Deborah says she was whipped into voting against the anti-smacking legislation the first time round. With a conscience vote should a list MP exercise his own conscience or the party conscience? And should a constituent MP exercise his own conscience, the conscience of his electorate or the party conscience?